If you have kids, it can be more like "mournings", right? It's a struggle in the morning. I for one am NOT a morning person and from getting the girls up and ready for school, to packing their lunches and with a baby surgically attached to my side, breakfast is the last thing on my mind. Cereal and milk was the girls poison of choice, but now that they're older, their taste is more "sophisticated" thus concluding that cereal isn't going to cut it anymore. ***ugh*** I remember one morning, I asked the girls what they wanted for breakfast (I don't know why I asked when we all had was cereal), Lily replied "Mmmm... I want something savory". Boy, she stumped me there. HA! You should've seen me... in my pajamas, baby on hip, hair disheveled, yesterday's make-up still on, mouth wide open with a blank look. How horrible... all we had that was remotely savory was last night's leftovers. Fearing that she may go to school hungry, Lily was happy to eat soup. Phew! Sophie on the other hand, ate cereal (bless her heart). So now both MR. and I make the effort of making the mornings more breakfast friendly. So I'm going to start a collection of breakfast recipes from friends and myself to fill your bellies with yummy goodness and get everyone off to a good start. If you have a recipe, I'd love to hear from you. The more recipes, the happier our tummies will be! Our first breakfast recipe is from Jen of Our Happy Family Blog. A wonderful gal with three kids and a fourth one on the way. I refer to her as the muffin lady. Seriously... she's got some yummy recipes and she was so nice to share her banana muffins with us. But it doesn't stop there... oh no! She also has a green smoothie recipe to compliment the muffins. When Venus asked me if I'd like to do a guest post with breakfast ideas, I knew the perfect the recipes to share... I'm not a big fan of early mornings, but I do love feeding my family healthy breakfasts! We're big fans of muffins over here; they're fast and easy and using the right ingredients, nutritious too. I often throw in a batch of muffins while I'm cleaning up after dinner and leave them cooling on the counter overnight, because it's just so wonderful to wake up to fresh, homemade muffins that you didn't have to get up early to bake! 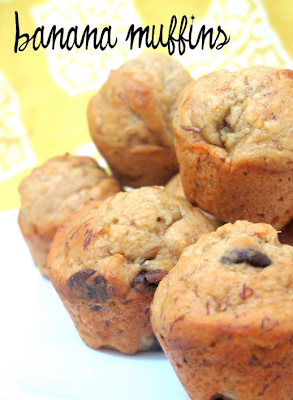 I serve them with a smoothie or some fresh fruit and it makes breakfasts a snap. 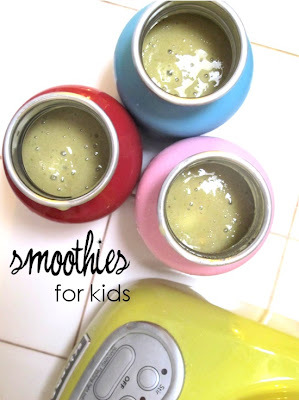 These mini banana muffins and green smoothie are my go-to recipes, and a great way to pack some healthy food in my kids before we start our busy days! Mash bananas in large bowl. Add ground flax seed and water and stir. Add honey and applesauce and stir until creamy. Add flour, baking soda, and baking powder all at once and stir until well combined. Add chocolate chips or walnuts if desired. Scoop into nonstick mini muffin pan and bake at 350 for 15 minutes. Blend until liquified and enjoy!